With the trend for experiential travel continuing to make tracks, luxury travellers – or ‘Luxplorers’ – are adapting a ‘carpe diem’ mindset, pursuing adventures that allow them to traverse the world in style. Fairmont Maldives Sirru Fen Fushi has announced the launch of its safari style Jungle Tented Villas that offers authentic experiences of outdoor living under the stars at the heart of resort’s inland jungle. 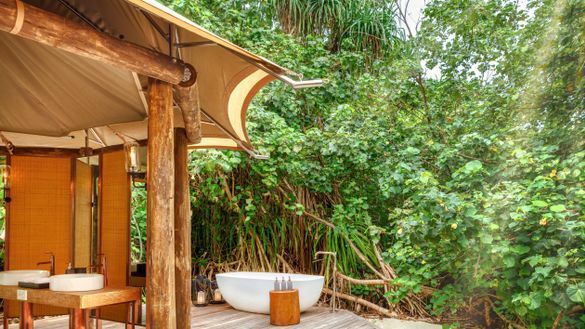 Unleashing the explorer in every traveller, the Tented Villas offers travellers a safari-style, alfresco luxurious living with an outdoor rain shower, roll-top tub and locally-sourced rustic interiors with complete seclusion. Set in their own private wonderland of wilderness, the Tented Villas are built to mirror the beauty and diversity of the island’s verdant flora and fauna. Built with wooden frames, amber-toned interiors and walls swathed in white canvas, the indoor and outdoor areas offer a spacious alfresco lounge space complete with handmade wooden furniture, bathing facilities and swimming pool – allowing travellers an opportunity to get closer to nature. A harmonious balance of seclusion, space and adventure, the Tented Villas house a master suite that feature a Californian king-sized bed with an en-suite bathroom, a sala for communal dining and relaxation that overlooks a private pool and outdoor bath. For reservations please email reservations.maldives@fairmont.com or contact +960 654 8888 and visit www.fairmont-maldives for more information.